January 2009 Update: This very same Ferrari 250 GT SWB California Spyder recently sold at Gooding’s Scottsdale Auction for $4,950,000. It is believed the seller bought the Ferrari from our profiled classified ad. Well bought in 1976 and very well sold. 10/15/08: The next chapter in Sports Car Digest’s look back at classified advertisements features a 1961 Ferrari 250 GT SWB California Spyder that was offered for sale in the June 1964 issue of Road & Track and the April 1976 issue of Hemmings. The California was conceived by U.S. Ferrari importer Luigi Chinetti, who recognized that his American clients would flock to a great looking and fast open top Ferrari, especially those in sunny California. While made famous to the general public by “Ferris Bueller’s Day Off”, the California Spyder was already well known among Ferrari cognoscenti not only for its dashing and sumptuous looks, but also for its stout, race-ready chassis and engine combination. The Cars That Matter September – December 2008 price guide suggests $4,100,000 – $4,900,000 for a Ferrari 250 GT SWB California Spyder. If you bought the Ferrari in 1964 for $10,500, your SWB Cal Spyder would have returned an annualized 15% over 44 years – really good. However, if you were patient and bought the Ferrari in 1976, your $16,750 would have returned 19% annualized over 32 years – amazing. If that is not eye-popping enough, keep in mind that another SWB Cal Spyder similar to our subject set the all-time auction record in May when it sold for $10,894,900 at the RM Auctions Maranello sale. Special thanks to SCD reader Greg B. for this submission. If you have a favorite classified ad that you would like featured, please email a scan of the ad to mail@sportscardigest.com. Further, please feel free to share your tear-jerking or blissful (if you bought and held) stories with us via e-mail or the comments section below. I love that ad! Exact same model and year as the car in Ferris Bueller! Only they used a replica in the movie……. 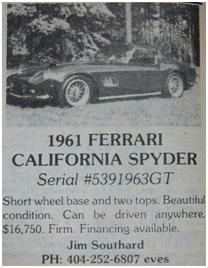 I also know that a 1963 SWB Cali Spyder was advertised in Hemmings Motor News in January 1984 for a price of $110,000 USD by Steve Pilkington in the UK. That was considered to be a bargain price in ’84 for an SWB spy. All three prices would have yielded amazing returns on your investment, which is really saying something in today’s market. If you bought it in 1984 for $110,000 as Greg mentioned, your return would be 17% annualized. Incredible. The cars back then were so cool they became instant classics. No wonder the values have sky rocketed.